Recently I was approached by a representative of Arm & Hammer's Simply Saline Nasal Care line. They sent me a free Neti Pot Kit so that I could test out their product and write a review if I felt compelled to do so. Since I had suffered with sinus congestion and infections for many years, I agreed to do the review of the product. Nasal irrigation is used clinically to flush out mucus and eliminate bacteria. A recent STUDY showed that certain bacteria are significantly eliminated by this procedure. Several bacterium species were significantly reduced, but not the H. influenzae that is responsible for a wide range of clinical diseases. Nonetheless, this study supports the claims of those that use such practices to reduce the complaints of sinusitis and allergies. A saline sinus flush can be accomplished in several ways. In the operating room a pressurized pulse-irrigation device is utilized to pump saline fluid into the sinuses and then suction it out. In the home, sinus irrigation can be as simple as sucking water in through the nose in the shower and then blowing it out. There are several nasal saline solutions on the market that one can use to simple spray saline into the sinuses, and then blow it out. 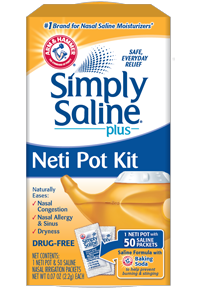 The Arm & Hammer Simply Saline Neti Pot Kit uses another method, more dependent on gravity. The neti pot is nothing new in self care. 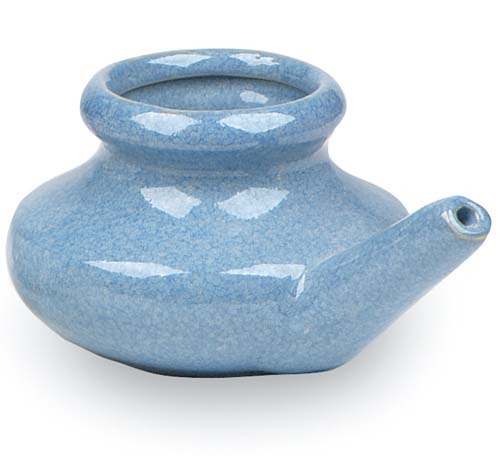 The neti pot was first used in India centuries ago to clear the breathing passages. It has been used for years in alternative health care and is typically made of ceramic (see left). Ayurveda uses this technique for cleansing, and it is thought that the practice has powerful healing benefits. The neti pot that comes with the Arm & Hammer kit is not much different, except it's made of plastic and it has a screw on lid. I'm not a big fan of plastic for anything that comes in contact with food or drink. But the neti pot is made from BPA free plastic from what I can tell. And as long as you don't use very hot water, it should be fine for this use. I do prefer the clay pots though, as long as they are free of lead. Also in the kit are packets of sodium chloride (salt) and sodium bicarbonate that are to be mixed with water in the neti pot to create the saline solution. The instructions say to add 8 oz. (1 cup) of warm water and mix in one to two packets to create the solution. To irrigate the sinuses you lean forward over a sink, tilt the head to one side, open your mouth and insert the nozzle into the higher nostril. Allow the solution to pour into the sinuses and out the other nostril. Gravity should pull the solution in and out. 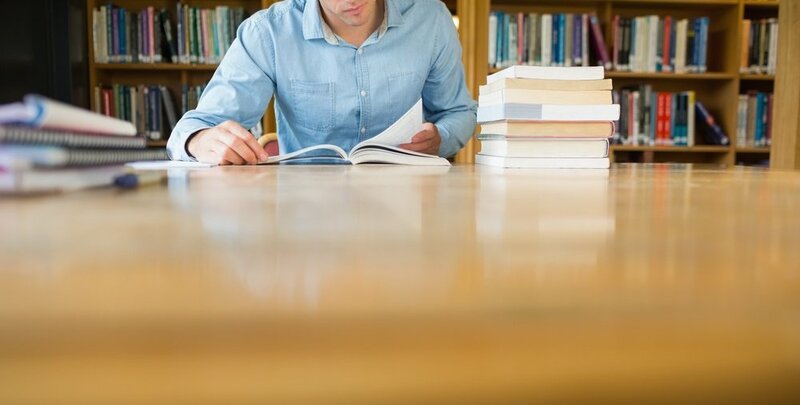 It can be a little tricky, but with a few moments to practice one can figure it out. Interestingly enough, shortly after receiving the neti pot in the mail for my review, there were news stories about two individuals that had died as a result of using a neti pot. These individuals are believed to have become infected with the Naegleria fowleri bacteria. This bacteria can be found in unsterilized waters and is very dangerous. This is a very rare occurrence. Nonetheless this threat can be completely avoided by using distilled, sterilized, or boiled water that has been allowed to cool. The N. Fowleri bacteria is destroyed in this process. This safety practice is not on the package that I received. But it has been added to the Arm & Hammer website, probably in response to the recent negative publicity. The package does encourage the cleaning and sterilizing of the pot in between uses. And this process too is very important. 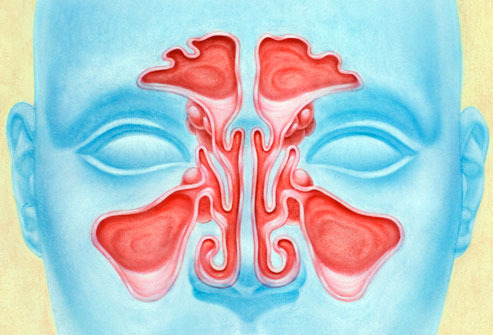 I suffered from sinus infections and allergies for 30 years. However, when I changed my deit and eliminated grains and most dairy (I'm a Celiac), this issue quickly cleared up for me. Nonetheless I still have the occasional stuffed up nose and allergy symptoms. In those times a neti pot has helped me to relieve those symptoms and expedite its clearing up. Daily saline sinus flushes using a neti pot are a beneficial nasal cleansing practice, especially for those that suffer with allergic rhinitis and chronic sinusitis. The Arm & Hammer Simple Saline Neti Pot Kit is a practical, easy to use product and will bring benefits if used carefully and properly. I must add that a ceramic pot with simple sea salt will do the same trick. Sign up for a complimentary 15 minute nutrition consultation with Primo Health Coach!